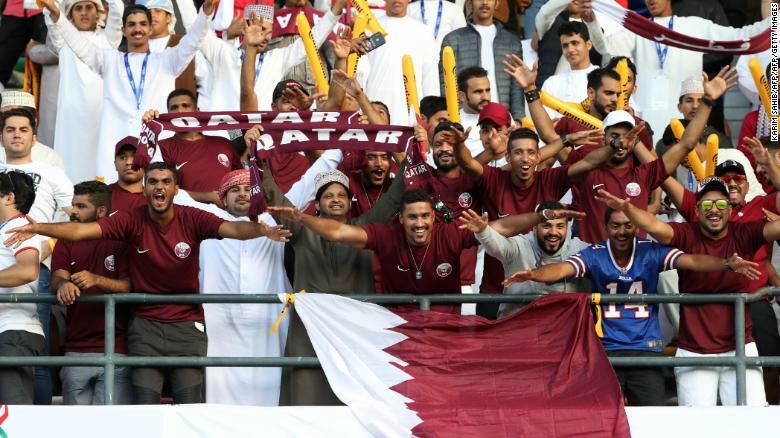 Qatar supporters cheer during the 2019 AFC Asian Cup final soccer match between Japan and Qatar. On Friday, Qatar made national sporting history when it defeated Japan 3-1 to win the Asian Cup. In a tournament that was as much about geopolitical rifts in the region as much as the sport itself, Qatar secured its triumphs courtesy of goals from the competition’s top scorers Almoez Ali, Abdelaziz Hatim and Akram Hassan Afif. Winning the title itself was unexpected, but doing so in the United Arab Emirates, one of the countries that joined with Saudi Arabia, Bahrain and Egypt to break off relations with Qatar in June 2017, made the achievement particularly satisfying. Qatar’s earlier 4-0 win over the UAE in the semifinal was particularly difficult for the host nation to swallow. Qatar couldn’t fly directly home from the tournament because of the boycott but the delay didn’t hamper the celebrations: the team paraded the Asian Cup through the streets of Doha on an open-top bus decorated with a picture of the team on the side. Qatar is the host nation of the next World Cup. Also on Friday, the U.S. Agency for International Development ceased all assistance to Palestinians in the occupied West Bank and Gaza, a U.S. official said. The deadline also ended about $60 million in U.S. aid for the Palestinian security forces, whose cooperation with Israeli forces helps maintain relative quiet in the West Bank. The decision was linked to a Jan. 31 deadline set by new U.S. legislation under which foreign aid recipients would be more exposed to anti-terrorism lawsuits. The Anti-Terrorism Clarification Act empowers Americans to sue foreign aid recipients in U.S. courts over alleged complicity in “acts of war.” President Donald Trump’s Middle East envoy, Jason Greenblatt, said the aid was cut at the request of the Palestinian Authority: “This aid was cut (not just suspended) at the PA’s request because they didn’t want to be subject to US courts which would require them to pay US citizens killed by Palestinian terrorists when the PA was found guilty,” he said in a tweet. The U.S. cuts have been seen as a means of pressuring the Palestinian leadership to resume the peace talks with Israel and to engage with the Trump administration ahead of its long-awaited Middle East peace plan. 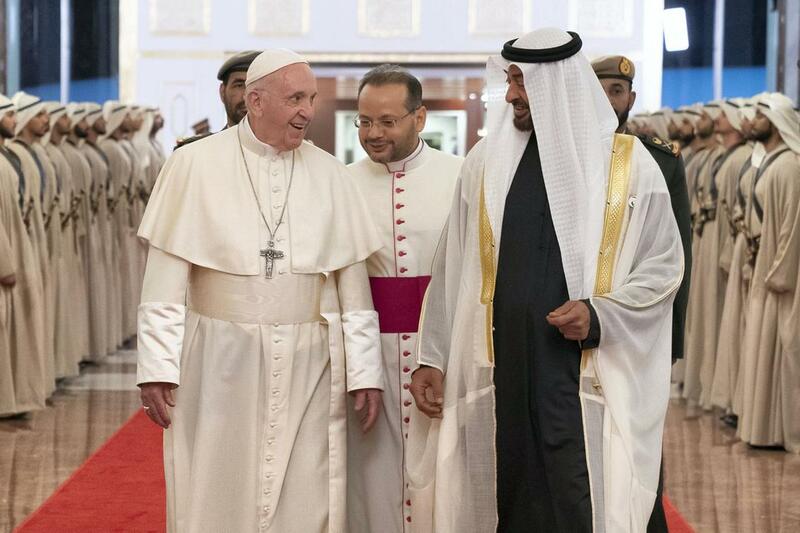 On Sunday, Pope Francis arrived on the Arabian Peninsula, becoming the first head of the Roman Catholic church to do so, just hours after issuing a harsh condemnation of the war in Yemen, where his host the United Arab Emirates has a leading military role. The pope will meet Muslim leaders and celebrate an outdoor mass for some 135,000 Catholics, an event with no precedent in the Arabian Gulf. He has said the trip, which ends on Tuesday, is an opportunity to write “a new page in the history of relations between religions.” The UAE, which named 2019 its Year of Tolerance, says the visit reflects its history as a “cradle of diversity.” The pope has already visited half a dozen predominantly Muslim nations during his reign, using the trips to call for inter-religious dialogue and to condemn the use of violence in the name of God.